Welcome to the fifth part of our summer series, where we are introducing some of Ohio State's top targets in the 2015 recruiting class. Last week, we caught up with Toledo Central Catholic linebacker Chris Green, who is one of Ohio's top junior prospects. This week, we're leaving the state of Ohio for the first time. 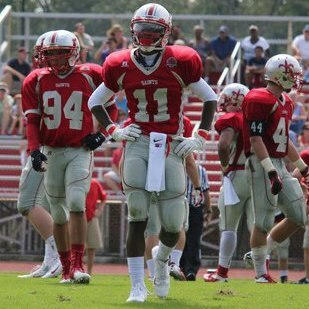 We spoke with Richmond (VA) St. Christopher's School cornerback Garrett Taylor, who checks in at 111 overall in the 2015 24/7 composite rankings. The talented defensive backs already boasts offers from the likes of Boston College, Clemson, Duke, Iowa, Kentucky, Maryland, Nebraska, North Carolina, Ohio State, Oklahoma, Oklahoma State, Ole Miss, South Carolina, South Florida, Stanford, Tennessee, Vanderbilt, Virginia, and Virginia Tech. 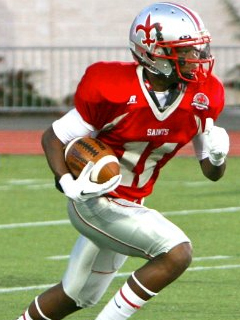 The 6-1/185 corner recently receiver offers from two major schools in Ohio State and Stanford. He was very excited to receive offers from both of these elite football programs. "Right before school ended Ohio State stopped by my school to watch me practice. Later that night I was told to call them and they offered me a scholarship. Coach Meyer was very impressed with me and really wants me to get on campus for a visit.," Taylor told Eleven Warriors. "The other big offer I got was from Stanford. I visited there over Father's Day weekend and had a really good time. I have a very good relationship with their coaching staff." The junior standout has had a fair amount of contact with the Ohio State coaching staff since they extended him a scholarship offer near the end of May. "I had a lot of contact with the Buckeyes after they offered me. I talked to them at least once a week," he said. "The contact fell off a little bit because I've been really busy training for my football season, but I'm going to start reaching to them more now that fall is here and football season is about to start." Taylor is in the process of building a very good relationship with Ohio State wide receivers coach Zach Smith who is the main recruiter in the state of Virginia. "I usually talk to Coach Smith. He has even put me on the phone with Coach Meyer a few times," he said. "When we were first getting to know each other, he just asked me how I was doing and stuff. Now we talk a lot more about football. He usually talks to me about their star corner Bradley Roby and how he came in as a freshmen and hes developed into one of the best corner's in college football." The star defensive back has also talked to Ohio State's defensive backs coach Kerry Coombs and has built a solid relationship with him as well. "I've also talked to Coach Coombs, he stressed the great tradition of defensive backs they've had," he said. "The Buckeyes went 12-0 last year and have a chance of winning a title every year. He did a really good job of selling me on that as well." While he hasn't had the chance to speak with Buckeye head man Urban Meyer too many times, the conversation they had went very well. "I got to see how great of a coach he is," Taylor said. "He's just really down to earth, it was just a great conversation. He wanted to let me know how interested they were which I really appreciated. I also got to see what kind of guy he is." Taylor was honored to receive an offer from the Scarlet and Gray back in May. "I had been receiving big offers throughout the spring and the one from the Buckeyes was a pretty big deal," he said. "I've seen them on national television my whole life. They've always been one of the top football programs in the nation. It really showed me how far my game has come when I got that offer." While he hasn't had the chance to make the trip to Columbus just yet, he wants to make that happen sometime this fall, maybe in September. "Ohio State plays Wisconsin at home at night and I really want to make it to that game," he said. "Most of my school's games are on Saturday, so I need to check my schedule to see if I'll be able to make it to that game." He hasn't made too many college visits yet as it is still very early in the recruiting process for players in the 2015 class, but there are some things he's looking for in a school when he makes his visits. "I'm definitely trying to see how my parents feel about the school, it's a family decision, especially for me, so if my parents feel comfortable with a school, that will make me feel a lot better about that school," he said. "Also the coaching staff, especially the position coach, the person I'll be working with the most for four or five years. Then also looking at the facilities. I want to play at the next level so it's important for me to see what they can offer to improve my game. Then academics are really important to me and my family. I want to major in some kind of business or law." While he isn't ready to narrow his list of schools, Taylor does have a couple of schools that stand out to him in the early part of the recruiting process. "I'd say some schools are sticking out, but I don't have any favorites right now," he said. "Ohio State, Virginia Tech, Stanford, Vanderbilt, Clemson, Tennessee, and Oklahoma are some of the schools that have stood out for me." He hasn't had the chance to make many visits, but he did make it out to Stanford over Father's Day weekend where he had a very good visit. "I went out there over Father's Day weekend for a junior day," he said. "I had the chance to meet Coach Shaw. The whole day was really great, especially getting the chance to sit down and talk to him. I also got to talk to some professors and learned what they expect out of their students. I got a tour of the facilities too. They're about to upgrade their stadium as well which should be really cool." He isn't sure when he wants to announce his college decision. He could decide early or late depending on how the next couple of months transpire. "I don't know, if I were to guess it would be after my junior season, maybe next summer" Taylor said. "However, if I can't make up my mind by then, I'll definitely wait until my senior season is over." In addition to Ohio State, the star cornerback would also plans to visit Clemson, Oklahoma, and others this football season. However, his main focus is on a successful junior season this fall and a run at a state championship. "First and foremost I want to get my team back to the state title, but win this time," he said. "Individually, I would like to get double digit interceptions, which I know will be really tough to accomplish. I'd also like to return a few picks for touchdowns. I want to have a big junior season to help with recruiting and lead into my senior season."